Eugene, how long have you been working in RMANUN? I’ve graduated from Physics and technology faculty of local Humanitarian university. My specialty is “Physics and mathematics”. Then I’ve got Masters degree and proceeded to postgraduate studies. For some time I was a lecturer at the Department of physics in our University. In 2013 I started working with Minor Academy of sciences as a freelancer, and in 2015 I’ve accepted an offer to lead the newly created Laboratory of Space Exploration. 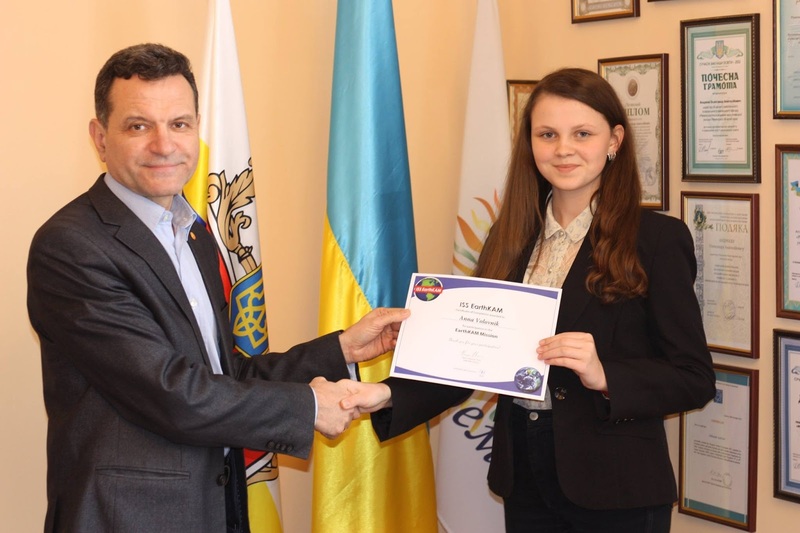 Tell us about people, who teach at the Minor Academy of sciences of Ukraine? There are 29 people in our team. Most of them are teachers, who work with children in sections. Also we have many freelance teachers, who usually work full-time in Universities. Number of sections in Minor academy of sciences: 148. Number of children, who study: 1480. Lecturers: 25 full-time employees, 78 – part-time. 3 teachers with Ph.D., 37 Candidates of science. What sections are the most popular in Academy? Children choose their favourite sections depending on their inclinations. We have a wide range of sections: poetry, microbiology, country learning, theoretical physics. Science picnic near RMANUM dedicated to the Inventor day. September 2017. At the same time, children and their parents think about future, and try to select those sections, that can help in future profession. So they tend to select highest-paying professions. When did you create Laboratory of space exploration in RMANUM? On the 1-st of October, 2015. What areas do you research in Laboratory? – studying radio waves and cosmic rays. One of the areas of research in Laboratory – studying the high layers of atmosphere. On this picture you can see different temperature of the cloud, depending on the height and density. We have a separate location and constantly update our equipment. 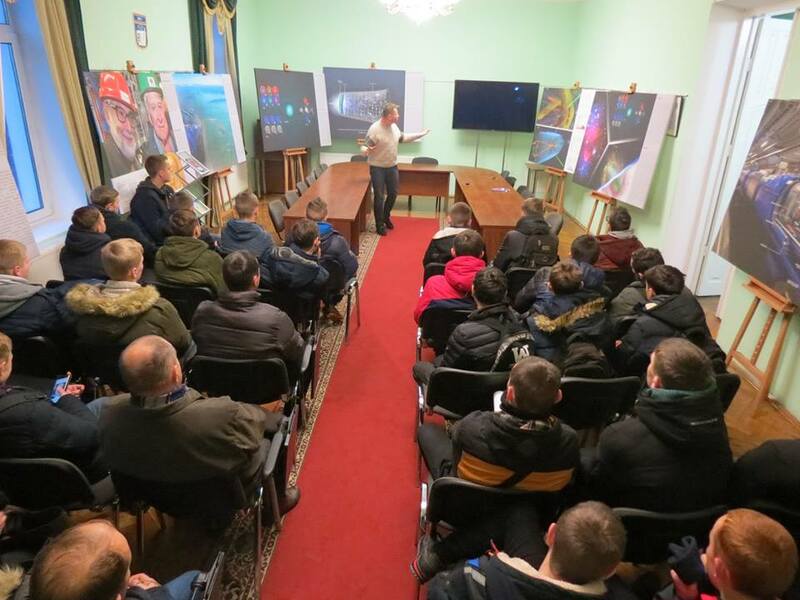 We have the best telescopes in Rivne region, which allow us to run sections “Astronomy” and “Aerophysics and space exploration” for High-school students. We observe stars and learn about all sorts of space objects. “CERN in pictures” exhibition, dedicated to 7 anniversary of cooperation between Minor academy of sciences and the European Organization for Nuclear Research. Who came up with an idea of looking for meteors using radio-locating method? 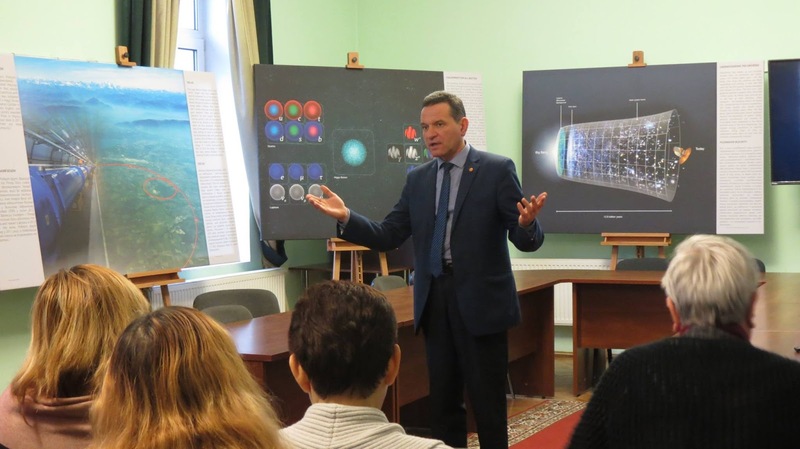 Our great friend, Joseph Dzhun (Ph.D. in physics and mathematics) was present at the defense of the Ph.D. thesis of current Director of Mykolaiv astronomical observatory Oleksandr Shulga. 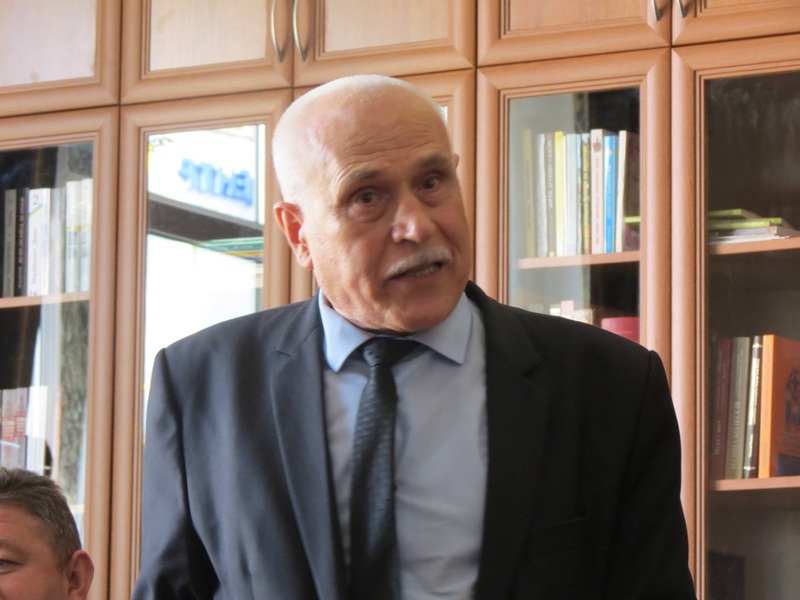 Joseph Dzhun: “You can’t even image the power of Astronomy. It’s better than fairy tales, better than fantasy. Come to us and bring your children. And you will see – they will change. They can become great people. And this can be the beginning of a great endeavour”. And Joseph Dzhun said: “We have smart guys, why don’t you help them.” Then we met with Oleksandr Shulga, defined the scope of cooperation and started working. 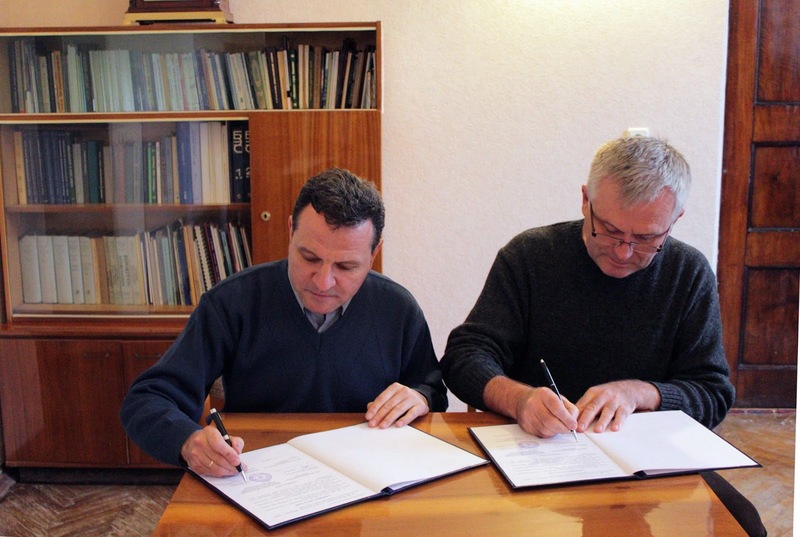 Oleksandr Andreev, director of RMANUM and Ph.D Oleksandr Shulga, director of Mykolaiv observatory sign cooperation agreement. What are the advantages of finding and registering meteors using your methods? Our method is rather efficient. We are using non-expensive equipment, that’s easy to find. And also – free radio waves. Besides, our observations don’t depend on weather and time of the day. 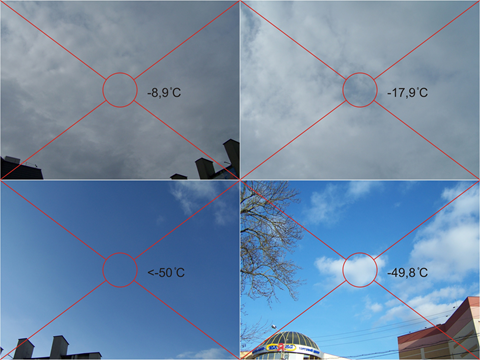 People are often using photo-fixation method, which is only good at night and during the period of fine weather. What distances fly those objects, that you were able to register? We register only those objects, that enter Earth atmosphere crossing the Karman line – border in atmosphere, approximately 100 km above the sea level. How long did it take to install necessary equipment? 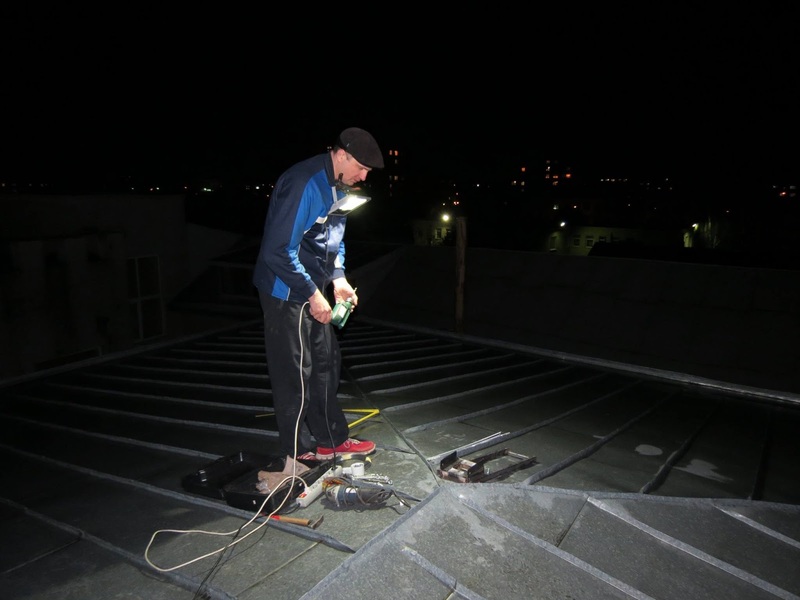 Two years ago in December 2015 we installed the equipment necessary to register meteors. It consists from antenna, installed on the roof of the House of Scientists, TV-tuner, and PC with special software. 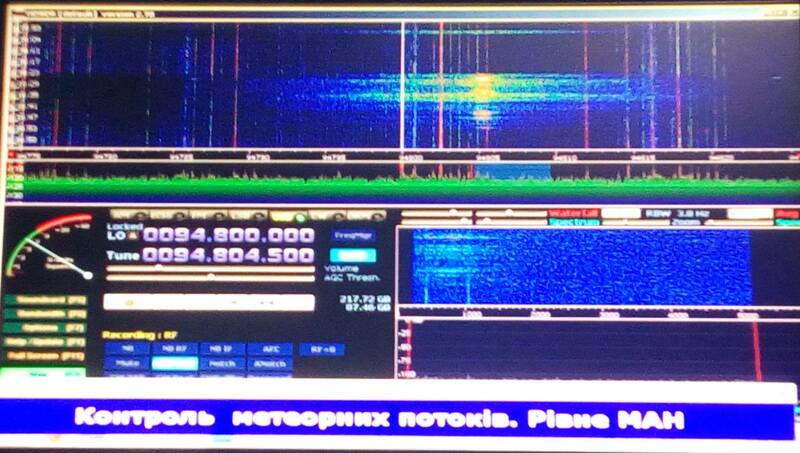 Our colleagues from Mykolaiv sent us the antenna. Then we built and installed 6 m stick. It wasn’t that easy, since we designed the stick in such a way, that it could carry more than 1 antenna. 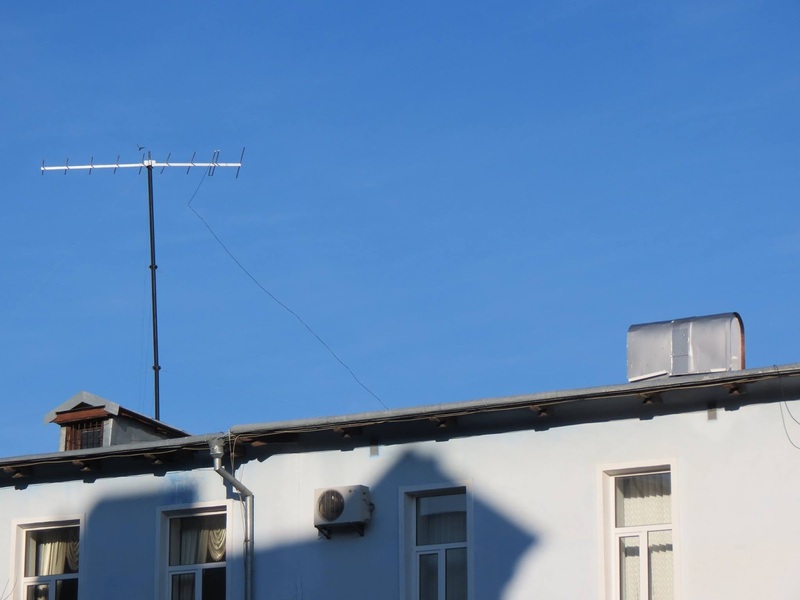 Antenna installed on the roof of the House of Scientists. Who was responsible for buying and setting up the equipment? We were responsible for setting up the equipment together with colleagues from Mykolaiv. In May 2016 we were able to start all-day observations and automatic data processing. Thanks to the TeamViewer software, our colleagues always have access to the necessary data. 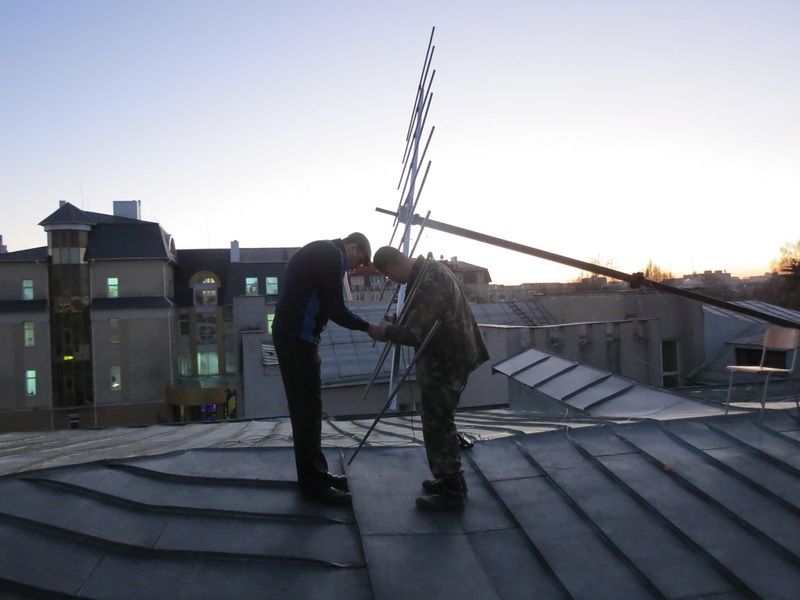 Installing the stick for FS-radar on the roof of the House of scientists, where Laboratory of Space Research is based. Is it possible for any amateur astronomer to install such an equipment and start observations? Yes. Anyone can do such observations. Materials and equipment are easy to find. A lot of things depend on your ability to manufacture the antenna and orient it in the right direction. It’s important for the quality of observations. Who is doing these sorts of observations now? Employees of the laboratory and pupils of 8-11 grades. The older our pupils grow, the more difficult things they study. Mathematics becomes more complicated. Not anyone can do that. When you register a meteor, do you need to conduct difficult math or geophysical calculations after that? We register a new meteor automatically. Using powerful FM radio transmitters we work in the mode of over-horizon reception. This way we can “see” ionic trace left by meteor entering Earth atmosphere. You can actually see on the screen how meteor travels thanks to the changes in the signal. 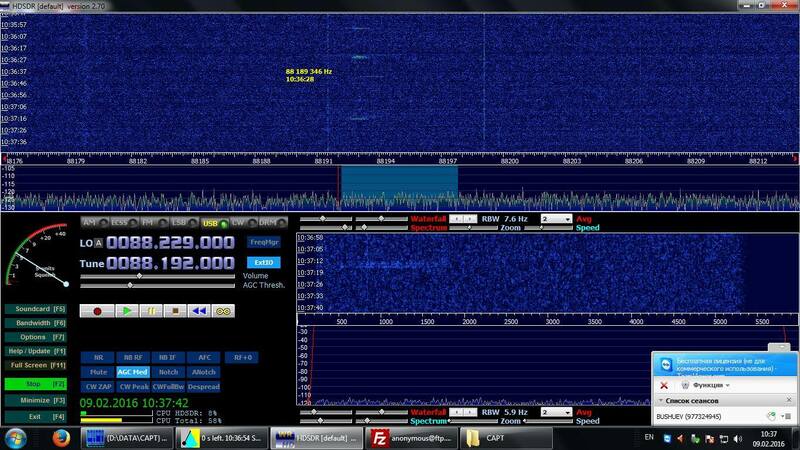 Also software records this signal, and it can be played back if necessary. Thus, to register a new meteor, there is no need to conduct any calculations. Changes in radio signal as the result of meteors disturbing Earth atmosphere. RMANUM software automatically calculates necessary data. However, if we want to know meteor’s trajectory, speed and size, we would need to do additional calculations: compare the data from several observation points, understand, if any other observers registered this meteor, make necessary triangulation, define “doppler” bias. And then, if there is enough data – we make necessary calculations. Now with kids we’re developing the methodology for such calculations. After this work is over, we can automate it. How often meteors fall in Rivne region? Have you ever thought of searching for such space objects? Our radio-telescope can “see” meteor trajectory, that is located somewhere over the Carpathian mountains, in the middle between Budapest (where the main transmitting station is located) and Rivne (where receiving station is set). That’s why I can’t say anything for sure about meteorites over Rivne region. Probability of a meteorite falling in Rivne region is the same as anywhere else on our planet. The most of meteorites, that reach the surface, fall in the ocean, because its area is the largest. In order to be successful looking for the meteorite, you need at least localize the place, where it fell down. A time passes, and it looks exactly like any other stone, so the probability to find it among others is quite low. 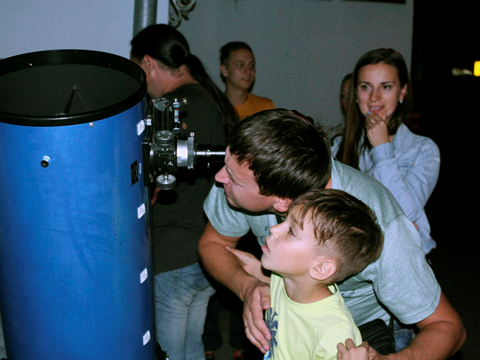 Did you register Rivne observation station anywhere in the catalogue of observation stations? Yes. We regularly publish our data on the web-site of researchers of meteor flows (http://www.rmob.org/), where it can be accessed by anyone. The name of our observation point is ua-rivne-man-space. How big is this network of observation stations worldwide? Where do you stand among other observation points? The number of observation points changes constantly. Some points work in the test mode, not regularly. When we registered and started publishing data, there were only 30 observation points. In September 2017 – there were 55 already. What telescopes do you have at your disposal? We have few optical telescopes. The biggest is 300 mm reflector. Also we have 200 mm and 125 mm reflectors and 90 mm refractor. Weather permitting, we conduct visual observations. In order to do that, we go outside of the city. There are several places, that we can use for observations. From time to time, we organise sidewalk observations, where anyone can join. We are now working on automation of our telescopes. We install necessary engines and “teach” them how to move right. 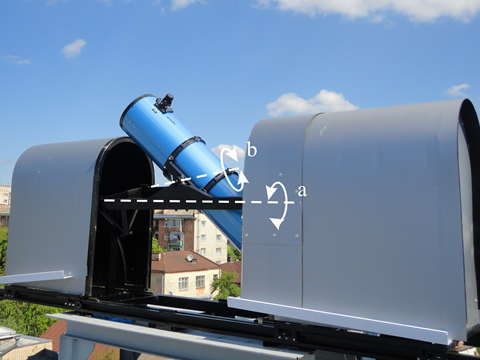 300-mm stationary telescope installed on the roof of House of scientists. Do you plan to participate in international programs or grants, aimed at developing of this sphere of astronomical research? It’s not our main goal, however, yes, we plan. Unfortunately, there are quite few such programs in our field. Recently we’ve started cooperation with NASA. 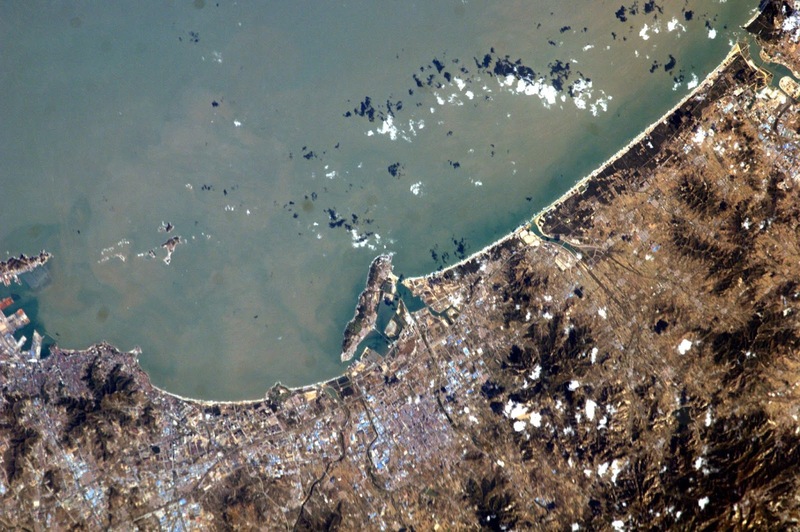 Laboratory of Space observations joined NASA project, aimed at taking pictures of the Earth from International space station. The name of the project is “Sally Ride EarthKAM”. Picture of the Earth surface taken during the program Sally Ride EarthKAM. Participants of the Minor Academy of Sciences took 150 pictures of territories, over which International space station flew during the light time 26-30 September. In February 2017 we also took part in a similar program. You can see the pictures that we took on our Facebook page. Participants of Sally Ride EarthKAM project receive their certificates. 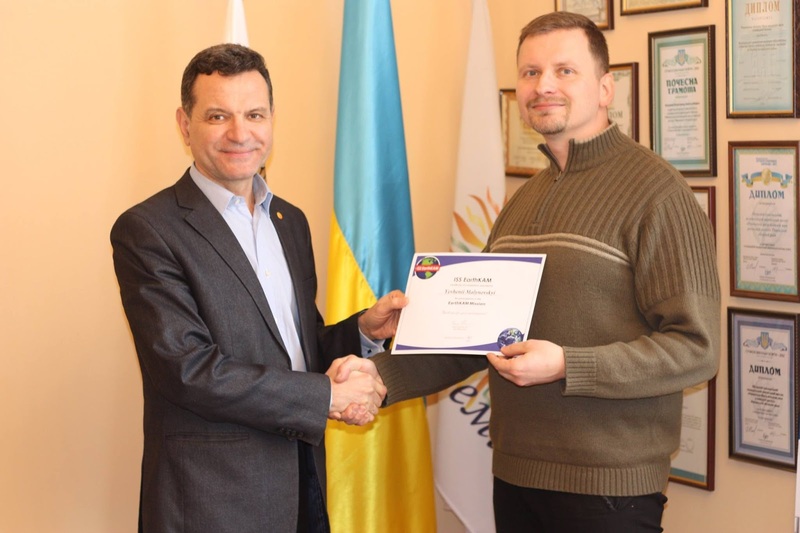 Do you get the support from management of Rivne Minor Academy of Sciences? Yes. We get constant support from Director of RMANUM Oleksandr Andreev. In fact, he gave a boost to the development of astronomy in RMANUM. 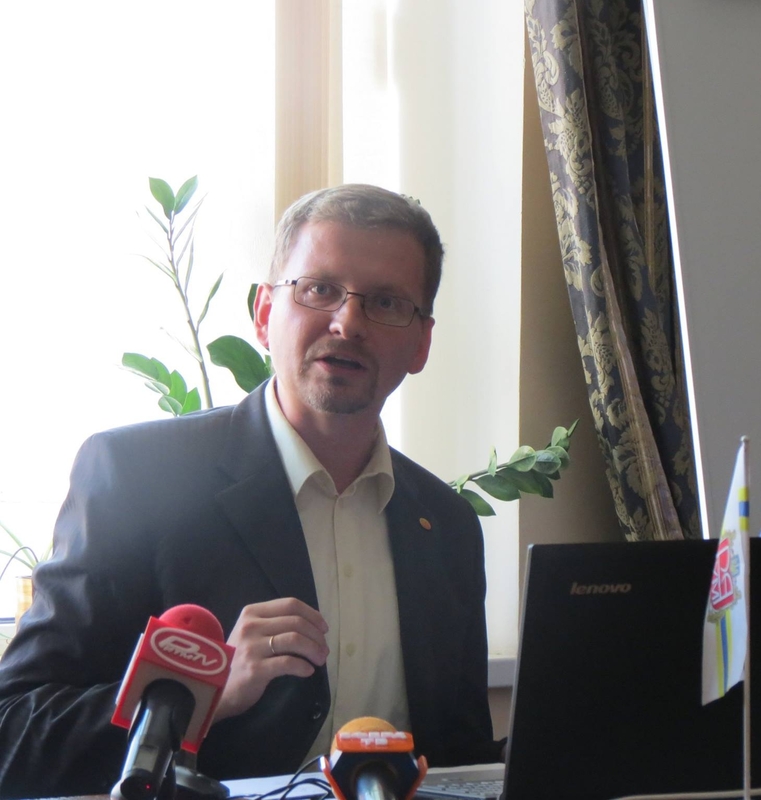 Oleksandr Andreev, Director of Rmanum. Huge proponent of the development of science and astronomy. What plans for the future of RMANUM do you have? We actively implement STEM technologies in sections related to exact sciences. We can proudly say, that we’re one the first organisations in Ukraine, that has practical results. 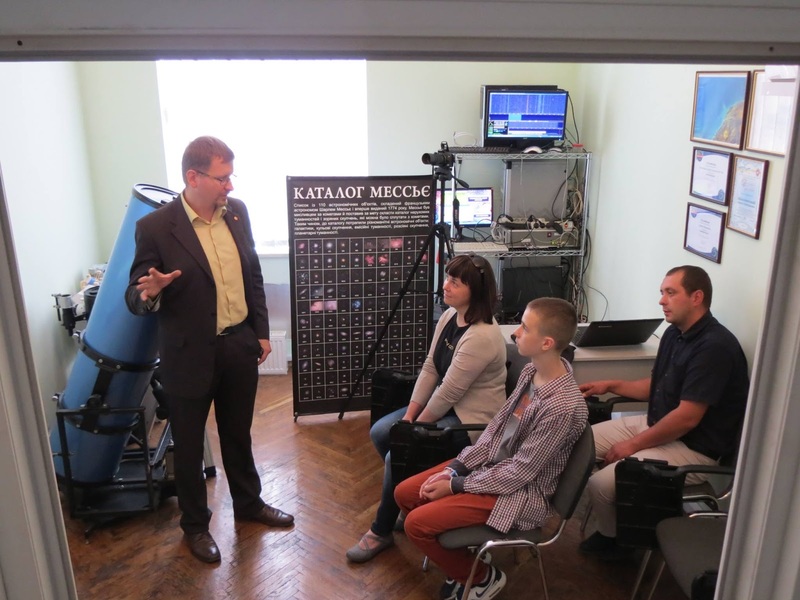 In cooperation with Mykolaiv astronomical observatory we plan to install a new telescope to observe geostationary satellites. Also we plan to complete the work of automation of optical telescopes. That would be a whole new level both for observations and for teaching our children. 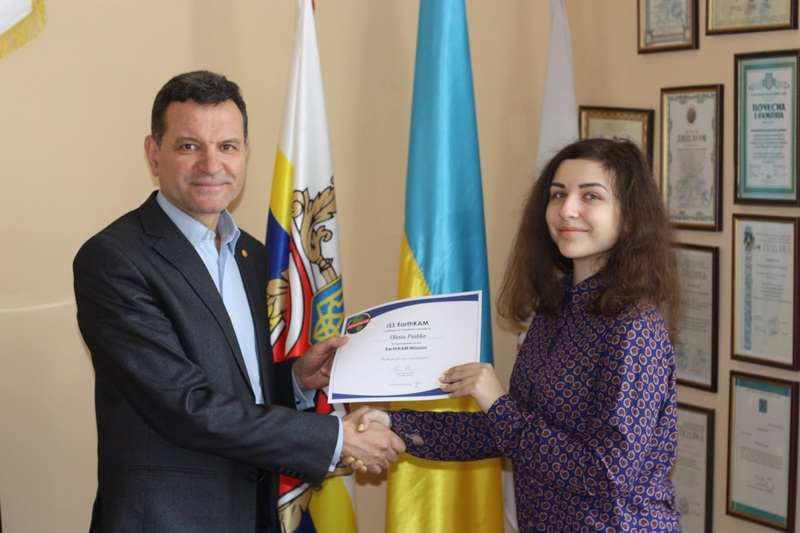 Definitely, we plan to continue working with smart and talented pupils, so that they could become famous not only in Ukraine, but all over the world. Yes. I hope, it will become true. I dream to build near Rivne a true observatory, so that anyone, who wants to explore space could work there constantly. Address: Ukraine, 33028, Rivne, S.Petliury str., 17 (Rivne House of scientists). RMANUM Laboratory of Space research Facebook page. Join us on the mission of true science exploration!